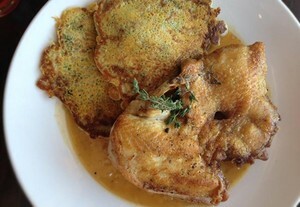 Roast chicken and Parmesan pancakes at Pullman Kitchen in Santa Rosa. Photo courtesy of Heather Irwin. Cinco will be opening in the Barlow later this spring. 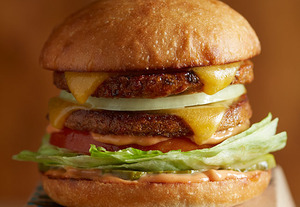 Natural foods giant Amy’s Kitchen is planning a meatless fast-food experience in Rohnert Park. Photo courtesy of Amy’s Kitchen. Been working your core lately? We sure hope so, because it’s about to get a serious workout this week. Sonoma County Restaurant Week starts Monday, with seven days of dining adventures awaiting you. Throughout the county, participating restaurants will feature two-course lunch menus for $10, $15, or $20; and three-course dinner menus for $19, $29, or $39. It’s one of my favorite ways to check out new restaurants and revisit old favorites. ~BACKYARD~: The $29 dinner features wild mushroom soup, skirt steak with polenta and lemon-braised cabbage, and chocolate budino or candy cap mushroom ice cream. 6566 Front St., Forestville. ~BISTRO 29~: This great French bistro, which is never a disappointment, will be doing a $29 dinner. 620 Fifth St., Santa Rosa. ~CAFÉ LUCIA~: If you haven’t had a chance to try this Portuguese café, the $29 dinner is a great opportunity to sample some of the best of the menu, including the pork tenderloin “recheado” that’s stuffed with olive, figs, and almonds, and served with cheese and potato croquettes and a port sauce. 235 Healdsburg Ave., Healdsburg. ~CANNETI~: The weekly emailed menu from this Forestville roadhouse never fails to make my mouth water. Their $39 dinner includes grilled calamari with purple potatoes, crispy skinned spring trout with yellow chickpeas and squash chips, beef cacciatore with olives over white corn polenta, and chocolate mousse with cherries. 6675 Front St., Forestville. ~MATEO’S COCINA LATINA~: Mateo’s does true farm-to-table dining, with the meat and produce sourced from nearby fields. The $39 dinner includes asparagus soup, red wine-braised beef with celery root and horseradish, black cod with braised napa cabbage in a Meyer lemon cream sauce, and a Downtown Bakery sticky bun and flan. 214 Healdsburg Ave., Healdsburg. ~PULLMAN KITCHEN~: The $29 dinner is your chance to check out the signature Pullman roast chicken with Parmesan pancakes, and the housemade ice cream. It’s a BiteClub fave. 205 Fifth St., Santa Rosa. ~STARK’S STEAKS &AMP; SEAFOOD~: A $39 dinner that includes a Caesar salad, a 16-ounce rib eye with a baked potato, and a warm chocolate soufflé cake? Um, yes. 521 Adams St., Santa Rosa. ~TWISTED 2~: I still haven’t been here (I hear it’s a real gem), but maybe the $39 dinner for Restaurant Week is the impetus. The menu features Hawaiian sashimi with Asian slaw, Brazilian pork shoulder with black bean cassoulet, and strawberry shortcake. 29F Petaluma Blvd. North, Petaluma. ~UNDERWOOD BAR AND BISTRO~: Always a solid contender, Underwood’s $39 dinner includes flat-iron steak frites, Bellwether Farms ricotta ravioli, pan-roasted salmon with Calvados brown butter, and Meyer lemon cheesecake. 9113 Graton Road, Graton. ~VILLAGE INN~: This sleeper has a new chef, a new attitude and is looking to prove itself—which means they’re offering killer deal for $29. The menu includes parsnip-white bean soup with porcini beignets; clams casino with saffron poached clams and pork belly; lamb shank with carrots and potato puree; and apple-cherry crisp with Marshall Farm honey gastrique or carrot cake with maple icing and butterscotch mousse. Impressive. 20822 River Road Blvd, Monte Rio. ~WISHBONE~: I’m in love with this funky little café, which is worth the trip even if you don’t live nearby. The $39 dinner includes bacon jam bruschetta; duck and rabbit pasta with duck egg fettuccine, bacon carbonara, and rabbit-lemon sausage, or spring veggie risotto; and chocolate truffle with peanut butter and caramel and vanilla panna cotta with lavender salt. 841 Petaluma Blvd North, Petaluma. ~ZAZU KITCHEN + FARM~ The $39 dinner includes grilled asparagus with preserved lemon aioli and duck egg, pork cheek pasta, and kaffir lime pie in a jar. 6770 McKinley #150 (The Barlow), Sebastopol. Cinco coming to the Barlow: As if the Sebastopol’s Barlow didn’t have enough destination-worthy restaurants, BiteClub’s gotten word that yet another one is slated to open in the coming months. 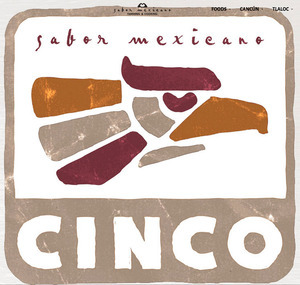 The casual Mexican eatery ~CINCO~ is being spearheaded by Bay Area restaurateur Jorge Saldana, who owns Tlaloc in San Francisco and Cancún in Berkeley. What’s especially interesting is that Saldana runs a 130-acre farm and retreat near Guerneville that supplies much of the produce for his restaurants and line of salsas. The opening menu is still in development, but dishes at his other restaurants include prawn tostadas, fish burritos, ceviche, mole(! ), fajitas, beef tortas, salads, and nachos. Simple, authentic, local. Word is that there will be a full bar as well. More info as opening gets closer. 180 Morris St., Sebastopol. Amy’s Kitchen Drive-Thru Menu Preview: Natural foods giant Amy’s Kitchen is planning a meatless fast-food experience in Rohnert Park. Piled with sweet pickles, lettuce, tomato slices, cheese, and “special sauce,” the “Amy’s Burger” is a “beefy” mouth-stretcher (without the beef, of course) that can satisfy the most devout carnivore. And that’s a good thing, considering that In-N-Out and McDonald’s will be within spitting distance of their Redwood Drive location in Rohnert Park. 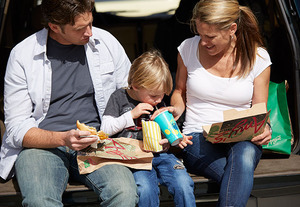 But getting that fast-food experience with the meat-free philosophy of Amy’s Kitchen hasn’t been, well, a picnic. “We’ve grilled enough burgers [in the R & D lab] to run the restaurant for a month and a half—multiple times,” said head food developer Fred Scarpulla. Trial and error can be delicious, though not necessarily easy. Not to mention that everything on the menu comes in vegan and gluten-free versions, which demands even more recipe testing. But as of late February, the opening menu will include burgers, meatless “chili” cheese fries, milk shakes, mac and cheese, pizzas, burritos, salads, and natural sodas made with GMO-free, organic ingredients, many of which are sourced locally. “We make it all, and we make it from scratch,” said Scarpulla. That also includes the potatoes, which are specially grown for the company. “We’ve tasted every kind of potato to find the perfect potato,” said co-owner Rachel Berliner. “I’m super-excited to pull up and just get this food to go,” said Rachel. “I’m that person.” If all goes well, much of Sonoma County will be those people, too. How many times have you asked yourself why someone can’t come up with a healthier version of fast food? Amy’s may have just cracked the code. Expect to pay less than $10 for a double cheeseburger, fries, and a shake, and less than $5 for a burrito. Redwood Drive at Golf Course, Rohnert Park.